The Cyclone II is a great Tornado foosball table that has high-end, quality parts. Tornado tables are our highest recommended tables for players who want to take the game seriously and learn how to play at the highest level. This is another commercial grade table from Tornado and was named by Consumer Digest as a best buy for 2001. The Cyclone II table is tournament quality like those used by professionals and can handle extreme competition. This table has some slightly higher quality parts over the Storm II, and provides a different laminate cabinet wall color over the Storm. You can't go wrong with either the Cyclone II or the Storm II foosball tables. 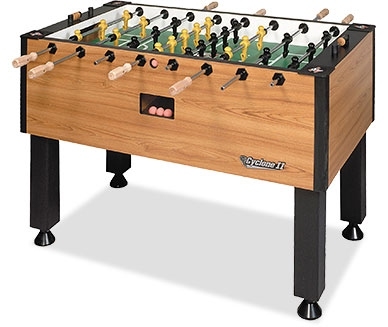 This foosball table is priced around $900-$950 US.